With Reading Football Club now in the Premier League, it also means that the Madejski Stadium will be host to the country’s top referees. 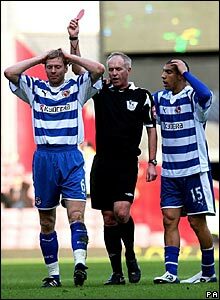 One referee however, that Reading fans won’t see this time around is Peter Walton. He was the oldest referee on the Premier League but it was not his age that made him leave the PGMO, which controls the top referees in this country. A few years ago he would not have been able to continue as long as he did but the Age Discrimination Act changed all that. There are now three things that determine whether a referee keeps his place on the league. One is the marks they receive from the clubs. Then of course there are the markings from assessors, Premier League referees are assessed at every game. The third thing is the twice yearly fitness tests. These had proved no difficulty to Walton but he admitted that what was getting to him was the recovery time. I know how he feels. When he started on the Premier League, he said it took him two or three hours to recover physically from a game. Nine years on, it would more likely take two or three days. Walton’s view on refereeing has always been refreshing. I remember him saying that when he reached home after officiating at a Premier League game, he would sink into an arm chair with a large glass of red wine to watch Match of the Day, hoping his match was on last. This would almost certainly mean that it had been free of controversy. So if it isn’t his marks or his fitness or that he lost his love of the game, why will we not be seeing Peter Walton refereeing this season? The reason is that he has been head hunted by the Major League Soccer of America to be General Manager of North America’s Professional Referees’ Organisation. His task is to devise a ten year plan that will ensure that by 2022, North America is home to world-class referees. There are 144,000 referees in America with just 13 operating in the MLS of which two are full time. Fans, managers and pundits in this country often complain about our referees but it’s worth remembering how highly they are thought of in the rest of the world. Don’t forget that the last FIFA World Cup referee was an Englishman, Howard Webb and another Premier League referee, Mark Clattenburg was chosen to referee this year’s Olympic final. Peter Walton’s appointment is another example of this world wide appreciation of their standard. But it’s not just overseas. Above Peter Walton’s desk in New York there is a framed letter from Sir Alex Ferguson, wishing him well in his new position.